Hypothesis is a free Chrome extension to collaboratively annotate and highlight webpages. You can create a custom group, invite your team members or colleagues, and then you all can highlight webpages, add a comment to highlight content, and reply to comments/annotations. You can also share a particular annotation manually by generating and sharing a link using this Chrome extension. Other users don’t have to install this Chrome extension to view the annotation, but he/she must create a free account to collaboratively highlight and annotate webpages with you. Apart from this, you can also highlight and annotate webpages publicly. Anyone who has installed this extension and accessed the same webpage will be able to see your public highlights and annotations. If you want, you can also highlight webpage without adding any annotation and that particular highlight will be visible to you only. Moreover, an option to create a private note in a webpage is also available. So, this is a multi-purpose Chrome extension which is very useful. In the screenshot above, you can see that I highlighted some content on a webpage, added annotation/comment, and a member replied to that comment. All the annotations, replies, etc., are visible in the sidebar of this Chrome extension. 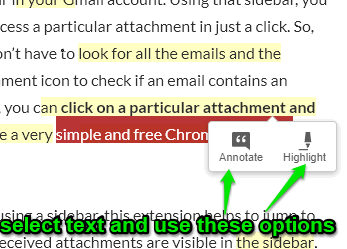 How To Collaboratively Highlight and Annotate Webpages In Chrome Using This Extension? This is a very easy to use Chrome extension. First of all, open its homepage and install it. After installation, it prompts you to create a free account so you can use this extension. All your highlights and annotations are also stored in your Hypothesis account because of which you are able to see and add annotations as well as highlights in any webpage. After installation, its icon will be visible on the top right side of the Chrome browser. That icon is used to activate/deactivate this extension. Moreover, that icon also shows the total number of annotations done by you and others in that webpage. When the extension is active, you will see a sidebar on the right side which shows two icons: Show/hide highlights and add a public/private note to a webpage. You can expand that sidebar to see the annotations, option to reply to annotations, share annotations etc. But, all this will visible only when you and others will annotate webpages. So, to highlight and annotate webpages collaboratively, expand the sidebar of this extension and then click on “Drop down menu” as highlighted in the screenshot below. That menu helps to select if you want to annotate webpages publicly or by creating a group. By default, “Public” option is selected. To highlight and annotate webpages with specific people, click on “New Group” option. After that, you can give a name to that group and invite people of your choice. When they will install this extension and join the group, you all can collaboratively annotate a webpage. Annotate: Annotate option lets you add comments to the selected content on a webpage. It also automatically highlights the selected content. You can also add a custom tag while annotating. Others are able to see your comment and reply to comment using the sidebar of this extension. Highlight: This option simply highlights the selected content with yellow color. Your highlight is visible to you only. 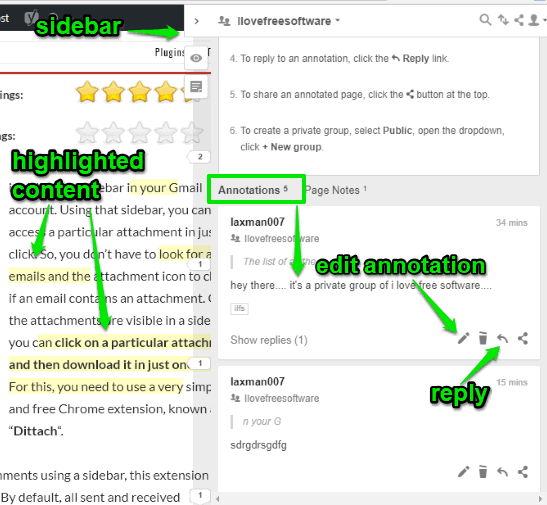 This way, you and others can annotate and highlight a webpage reply to those annotations, check highlights, etc. There are many other Chrome text highlighting extensions also available, but those let you highlight content for you only. This extension is much better in that case. Whenever you need to highlight and annotate webpages with your team members or other people, this Chrome extension will come in handy. You have the choice to create custom groups and add people of your choice to that group. I also like the features to highlight webpages and add notes to webpages privately.